Ever since she was a child, Chanda Holschbach had a passion for learning about, helping and loving animals. Her mother's nursing background laid a foundation of "bedside manner" and her father's entrepreneurial business background provided a real understanding of economics. 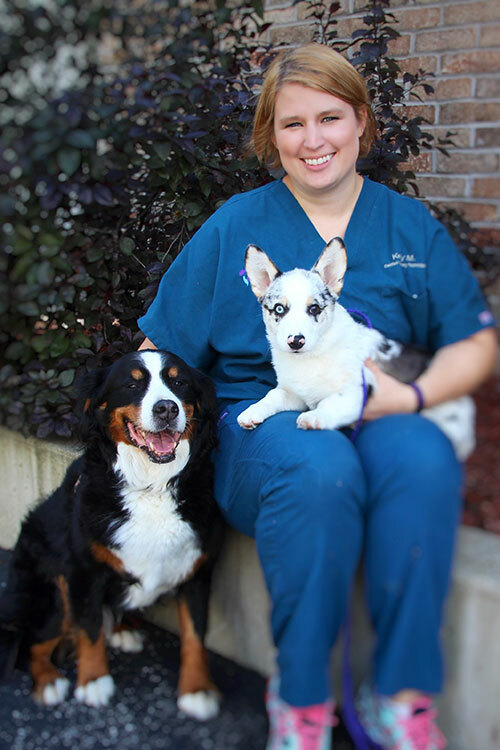 A graduate of the University of Minnesota with a degree in Animal Health, family ties brought Chanda back to Wisconsin. She began her tenure at Packerland in 1993 and purchased the clinic in 2007. 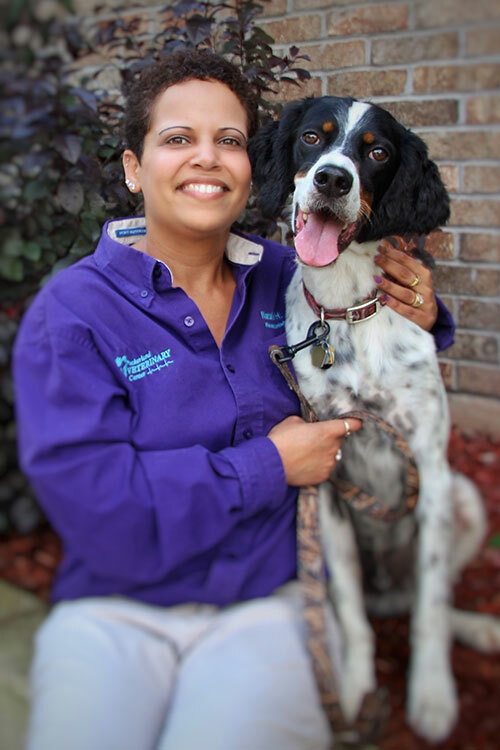 Her strong understanding of the business end of the clinic, in addition to her hands-on work with families and their pets, created the perfect recipe for Chanda to pursue the next level of patient care. Amy is Packerland’s Reception Coordinator and has been with us since 2002. She currently has one dog, Skips, and cats, Jordan and Daffodil. Amy was born and raised in Green Bay. Amy loves nature and all the beauty it provides and has the privilege of living on the water which allows her to enjoy many amazing sun rises and sunsets. When she is not working here, she volunteers her time for Keshena Animal Help & Rescue working with their spay/neuter clinics. In her spare time she can be found at bingo with her family, around a bon fire, at the shooting range, or just relaxing with a good movie and her pets. Julie was born here in Green Bay and, after graduating from high school, joined the US Army. She was enlisted for 12 years and is a veteran of the first Gulf war. One of our longest tenured employees, Julie has been a part of our Packerland team since August of 1998. She enjoys the challenge each day presents - learning new things, meeting new people and their pets and working closely with the staff. She loves spending time with her fiance Rick (yes, they will get married someday!) and has two pets at home – a cat named Karma and a dog named Chopper. In her free time, Julie enjoys fishing, hunting and going up north to visit family in Land O'Lakes. Natalie was born in Germany while her parents were both stationed there with the military and later moved to Mountain, WI where she grew up. 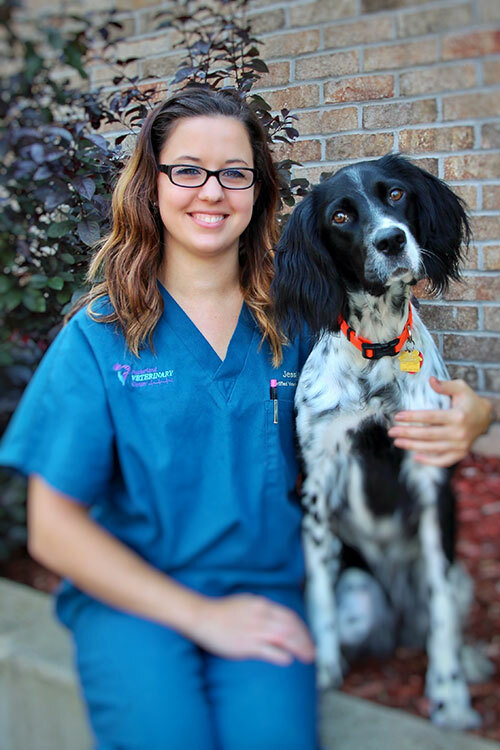 In June 2003, Natalie started working at Packerland which lead to her current pet, an English Setter named Blaze. When not at work, she enjoys returning to Mountain with her husband to spend time with friends and family. 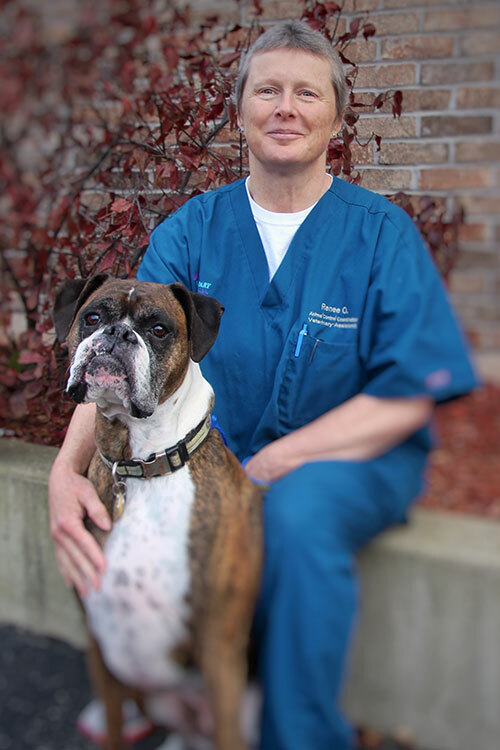 Susie joined the PVC family in 2014, but brought with her over 30 years of experience in veterinary reception and assisting. As a coast guard wife for 23 years, she moved every 4 years while on active duty and has been in the Green Bay area since 2000. She has 3 grown kids; a daughter and twin boys. When she isn't found at PVC, Susie could be called a crazy cat lady as she runs 3 B's Cat Rescue in her spare time. She has found a home at PVC and her knowledge and experience adds so much to our patient and client care. Amber grew up in the Suamico area, but after living in Indiana for nearly a decade, she returned home to the land of the cheese. When not at work, she enjoys spending time with her family and furry friend Peter the Cat, reading and crafting. 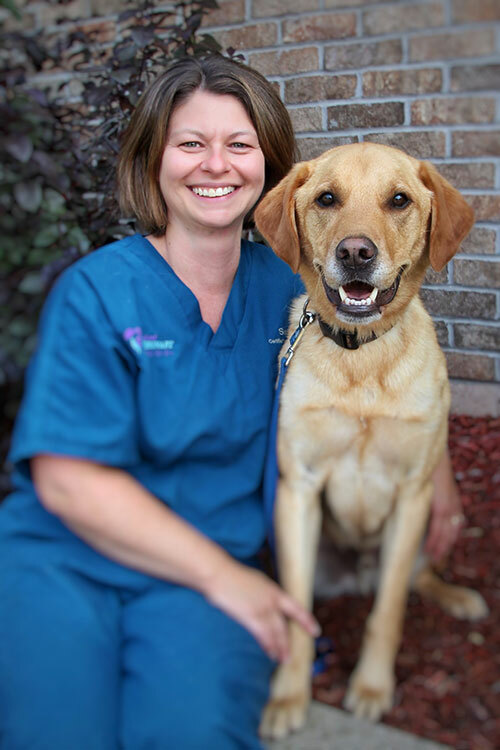 Jessi is Packerland's Treatment Supervisor and is also a Certified Veterinary Technician. She graduated from Madison Area Technical College in 2002 and quickly joined the Packerland team. 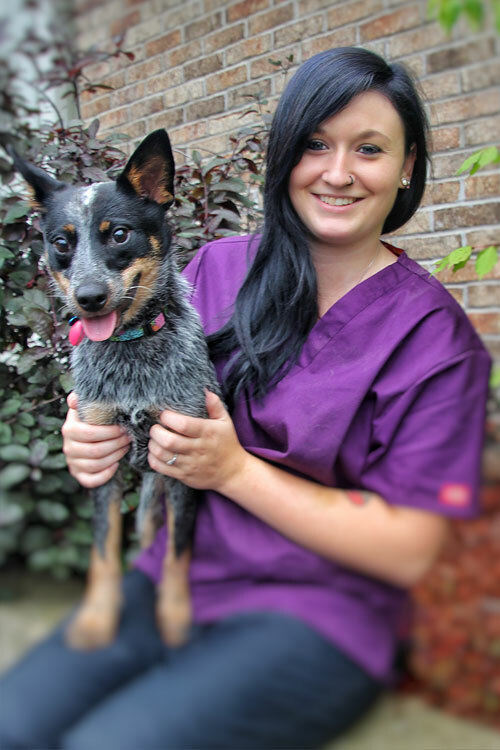 She enjoys the variation in the everyday work environment that veterinary medicine brings. Jessi has two cats and a Vizsla puppy, Paisley, and enjoys spending time outdoors with her husband and son in her spare time. A science geek with a love for animals, Chris always thought she would make her career I the field of wildlife and natural resources. However, after graduating from UW-Green Bay with a Bachelor of Science in 1999, she accepted a position at Packerland and those ideas quickly changed. 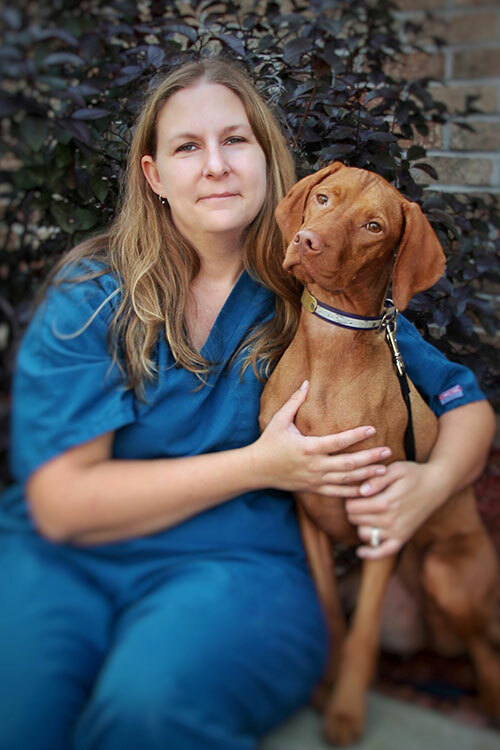 The field of veterinary medicine was able to mesh her love for science, passion for animals and a strange first aid hobby into the perfect job. 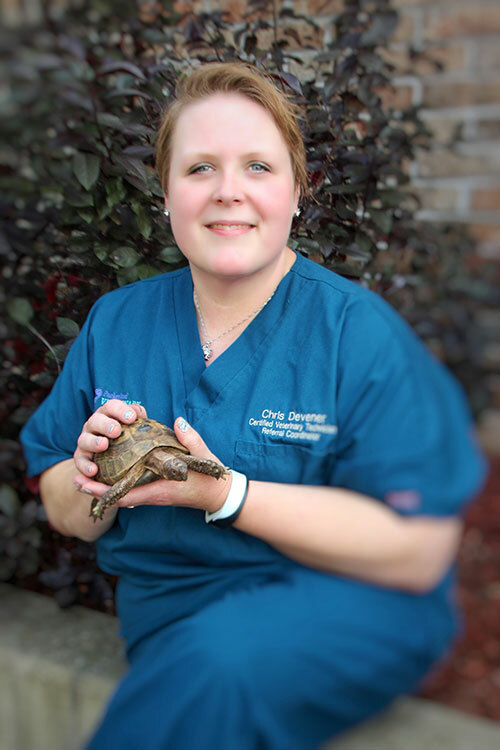 Being a Certified Veterinary Technician and our Referral Coordinator allows Chris to utilize her education and technical skills to improve patient health, and educate owners in preventative medicine and disease management. Areas of special interest include: orthopedics, soft tissue injury/wound management, spinal injury and arthritis/pain management. Chris is an avid reader, a gourmet cook, enjoys gardening, the outdoors, and especially kayaking. Sarah graduated from UW-Platteville with a degree in biology in 2000. After graduation, she moved to Green Bay and started working at PVC. 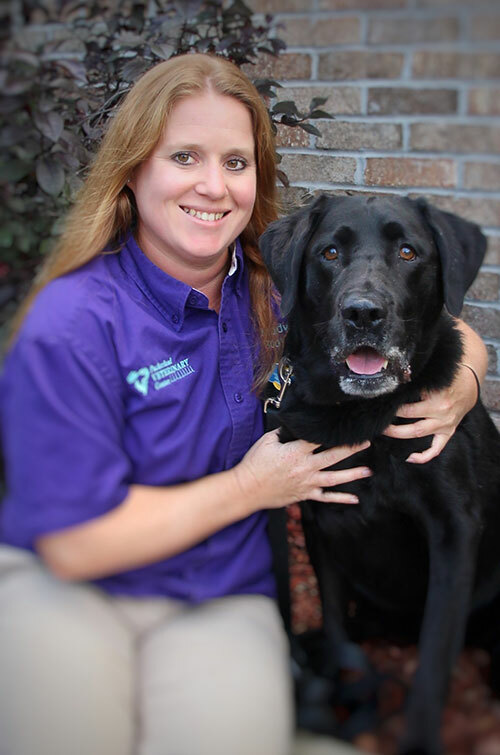 In June 2003, she passed the National Veterinary Technician exam and has since helped to start our Physical Therapy/Rehabilitation program. 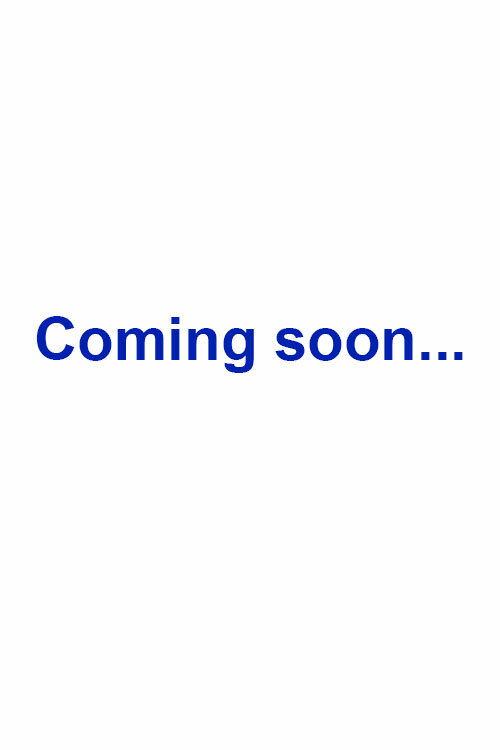 She enjoys traveling with her husband and sons and spending time with her yellow lab Si. 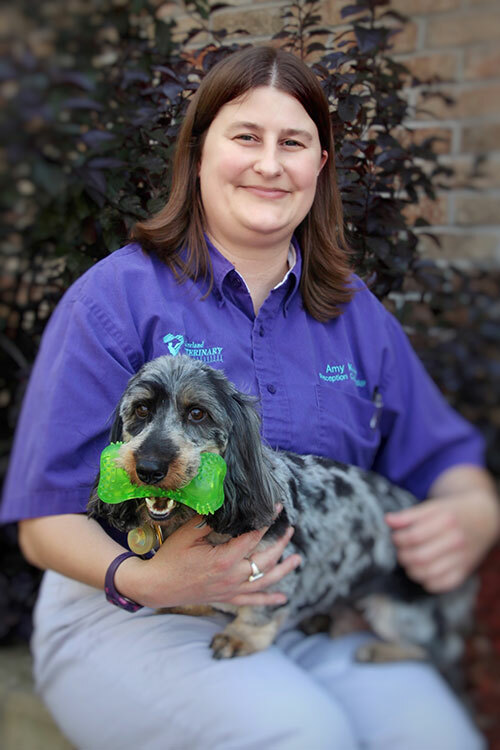 Born and raised in Green Bay, Amy has always had a passion for taking care of animals. As a child, she and her family fostered injured wildlife while also caring for their own menagerie of pets. In September 2004, Amy accepted a position at PVC and quickly realized that this was where she was meant to be. 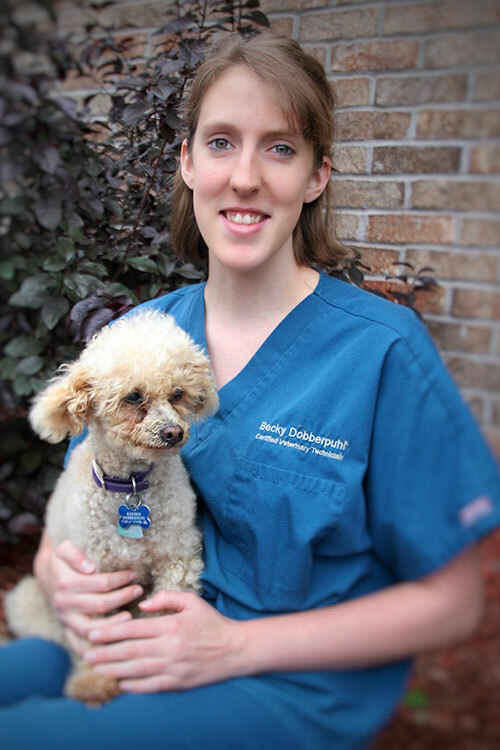 After 3 years of hard work and experience, Amy passed the Veterinary Technician National Exam in June 2007. Meeting the demands of her position at Packerland, Amy continues to enjoy her career and the fulfillment it brings her. Originally from Green Bay, Sarah moved back to the area in 2003 after graduating from UW-Madison with degrees in biology and environmental studies. She started working as an assistant at PVC in 2004 and obtained her Veterinary Technician certification in June of 2007. 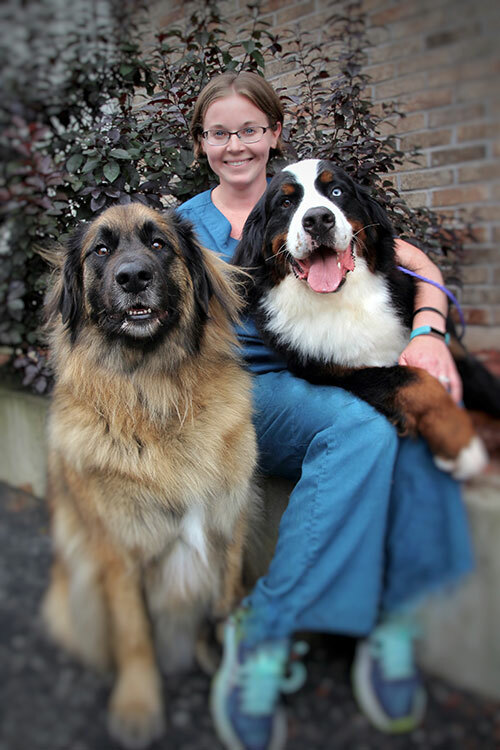 When she's not working, Sarah enjoys spending time with her husband, two kids and pets at home: Leonberger Freyja, Bernese Mountain Dog Baden and two orange kitties, Bucky and Badger. She loves traveling, anything outdoors and, of course, cheering on the Badgers! 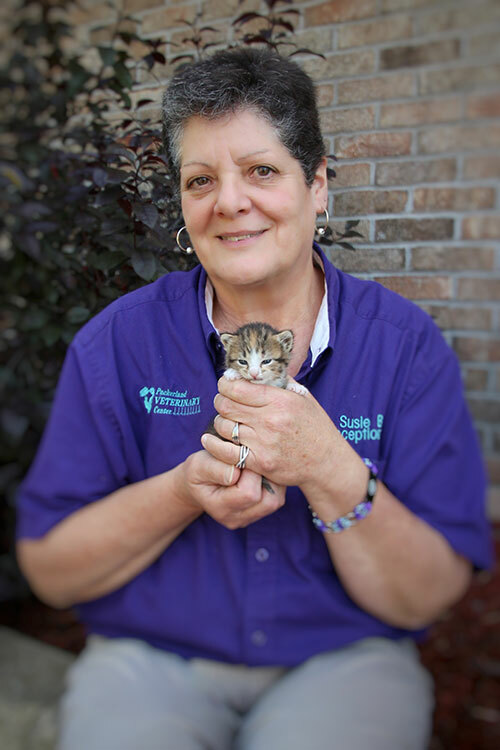 Renee was born and raised in Shawano, WI and has worked in animal care and sheltering since the mid 1980s with a special interest in fostering orphan and special needs animals. She has been at Packerland since 2006 and enjoys the variety that each day brings. Her hobbies include gardening, reading and volunteering. Pets at home include Boxer Reese, birds and a koi pond. 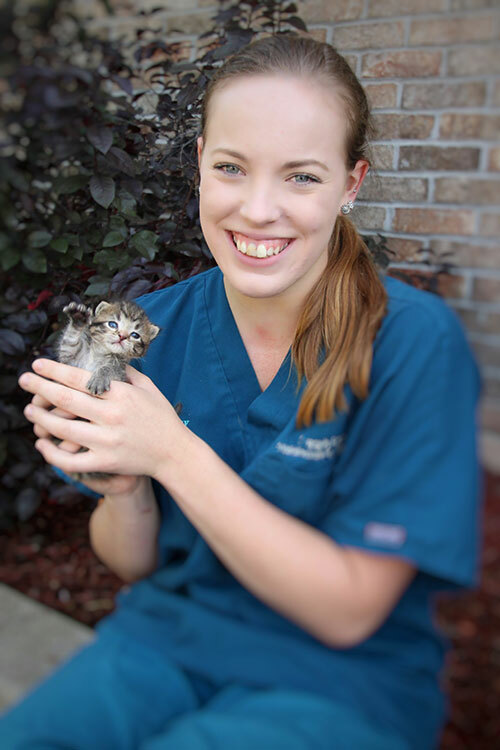 Born and raised in Green Bay, Jessica always knew that she wanted to do something in the veterinary field since she was a little girl as she was always playing with the turkeys, chickens, pigs, rabbits, dogs and cats that she had. She graduated from Madison Area Technical College in May of 2011 and obtained her Veterinary Technician Certification in December of 2011. She started working at PVC in October of 2012. Jessica has an English Setter named Ammo and 4 chickens at home. She enjoys spending time with her friends and family outdoors hunting, fishing and going four-wheeling in the mud. Kelly was born and raised in Ashland, WI, then moved to De Pere later in life. Growing up on a farm and helping rescue cats and finding them new homes are just a few things that strengthened her love for animals. After high school she pursued a degree in Animal Science at the University of WI- Madison. While in college, she traveled to Nicaragua and Honduras to volunteer in a 2 week spay/neuter clinic for stray animals. When not at work, she enjoys going back to Ashland to visit with family, horseback riding, watching movies, and spending time with her husband and her siamese/ragdoll cat, Sookie, rescued kitty Moo Moo and her newest addition, Winston the Corgi. Becky grew up on a farm in the town of Shirley which lead to lots of early experience in animal care. 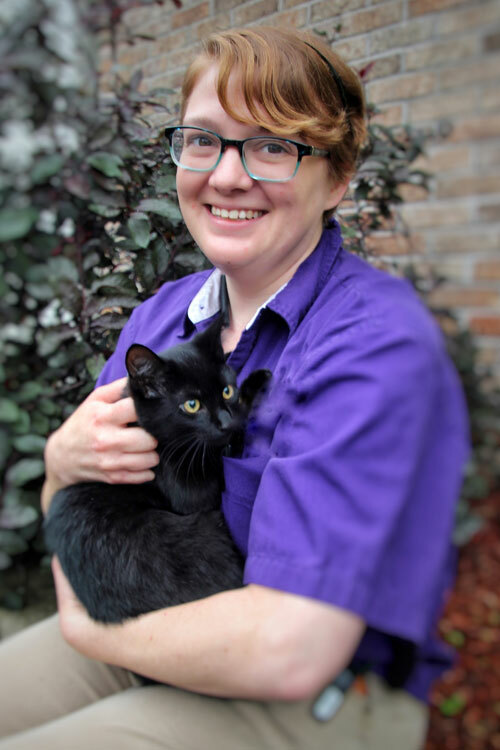 After graduating from De Pere High School it was only natural for her to transition to Madison Area Tech where she received her veterinary technician training. Her pets at home include Chopper the Lab Retriever mix and many barn cats. When Becky isn't helping out on the family farm or spending time with nephews she enjoys reading, painting, baking, decorating cakes and video games in addition to many outdoor activities such as swimming, 4-wheeling, snowmobiling and jet skiing. 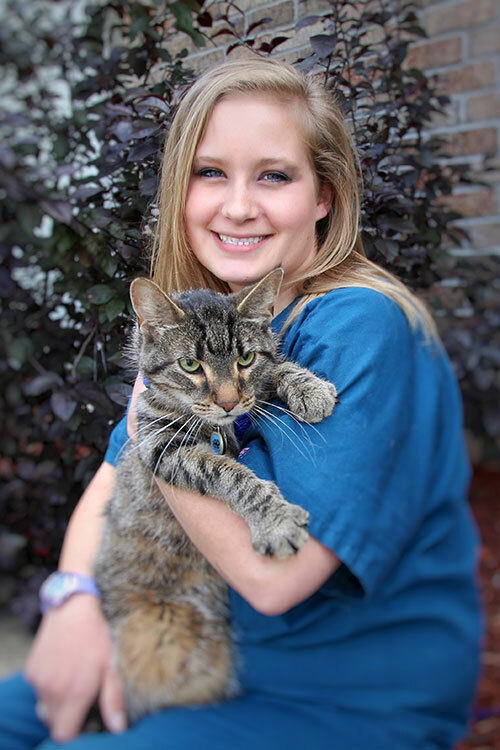 Britt graduated from the Veterinary Technology program at Globe University in Appleton in March of 2014. She loves working at Packerland because of the wide variety of cases that we see each day. She particularly enjoys watching the improvement of our physical therapy and acupuncture cases and loves working with our doctors on advanced diagnostics for sick patients. In her free time, she enjoys anything outdoors with her husband and family. She loves bow hunting and was fortunate to get an 8 point buck for her first deer! She has three cats; Jax, Charlie and Crookshanks. Angela graduated from St. Norbert College in May 2017 with a Biology degree and then started working at PVC in June. Angela grew up on a dairy farm in Randolph, WI and has always loved being around animals. In her free time, she enjoys reading and spending time outdoors. Angela hopes to use the experience she is gaining at PVC to go on to school to become a veterinarian. 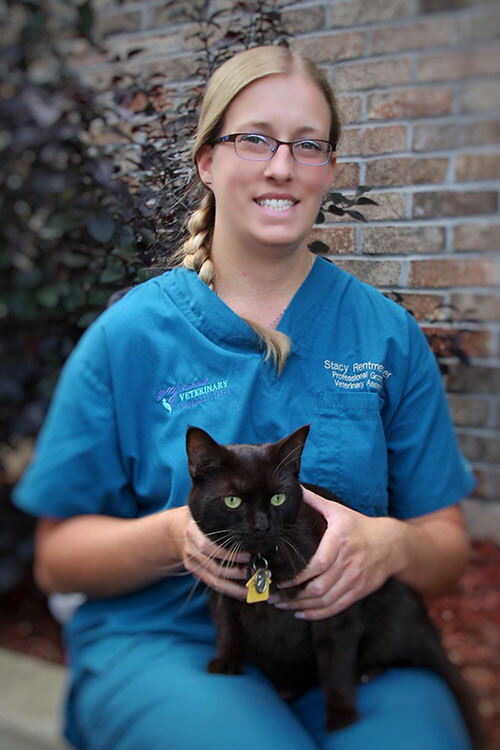 Stacy grew up in Green Bay and has always had a love for animals. 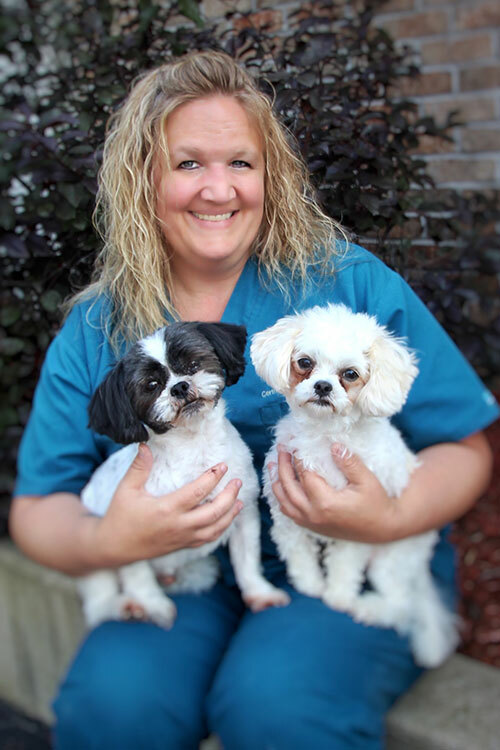 Growing up, she wanted to be a professional pet groomer and after graduating from Preble High School she attended Golden Paws Pet Styling Academy in Marinette, Wisconsin and received her professional certification. 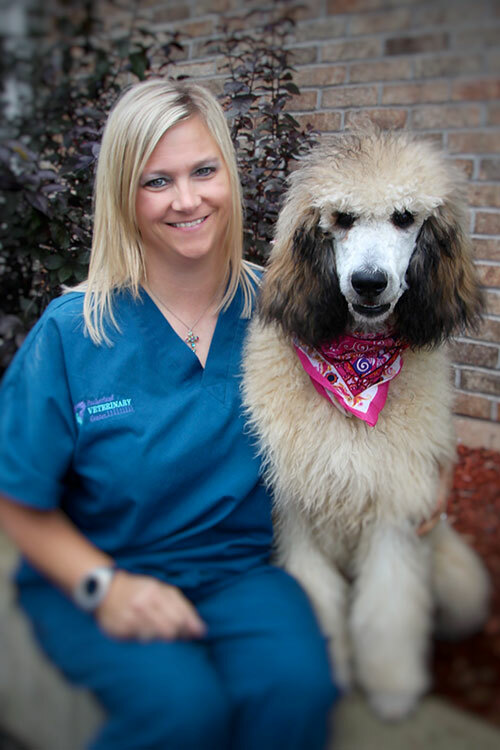 She finds it very rewarding to use her skills to help animals become well groomed and healthy. In her free time she enjoys fishing, waterskiing, and spending time up north. Stacy shares her life with her two cats, Whiskey and Bourbon. Hope was adopted from St. Cloud, MN and raised in River Falls, WI. She graduated from UW-Stevens Point and Animal Behavior Institute with degrees in Zoology, Psychology, Captive Wildlife and Animal Science. She's going back to college for Equine Massage Therapy, Stress Point Testing and Thermal Imaging. She loves spending time working with her horses Bacardi and Dutchess. She lives on a 4 acre farm with her fiance Josh, 3 dogs Myla, Zena and Lily, 5 barn cats, a goat Chester and her horses. Mandy first came to know PVC as a client. Impressed by the friendly and knowledgeable staff, she happily accepted the bookkeeper position when it was offered to her in March of 2009. 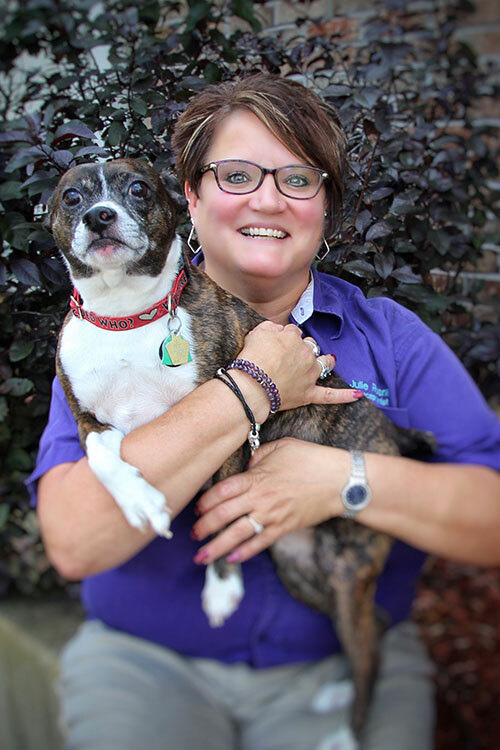 Mandy's love for four-legged, furry friends made the job that much more appealing. Mandy is the proud parent of Chayce, a black lab. In her free time, she enjoys spending time with family and friends, participating in sports, and anything outdoors.